Bring the water to the boil. Combine the sugar and stabiliser and add them to the boiling water, whisking all the time. Let it boil for 2 minutes. Pour the raspberry puree into a blender. Pour in the hot syrup and rose essence, and blend for one minute or until well combined. Cool it down completely in the refrigerator, then turn into an ice-cream maker. Keep the sorbet in the freezer until ready to serve. Bring the lychee juice from 2 tins to the boil. Plunge the noodles into the boiling juice and let them boil for 2 minutes. Drain the noodles but keep the juice, then plunge the noodles into the cold juice of the 2 other tins and keep them aside in the fridge until ready to serve. To serve, place the noodles in the centre of the serving soup plate. Pour the lychee broth around. 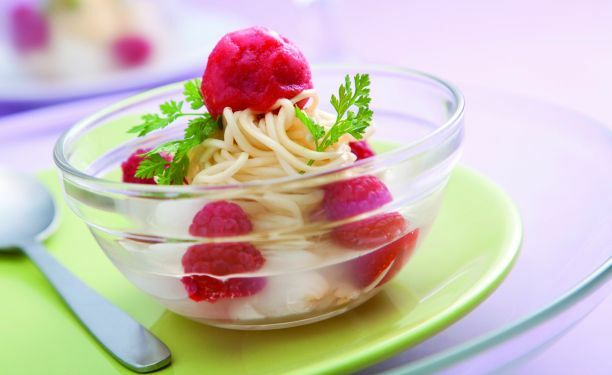 Add some lychees and raspberries around the noodles and top with the sorbet. Garnish with one edible flower and serve immediately.